Sub Pop has signed the enigmatic country singer Orville Peck, who will release his debut for the label in 2019. 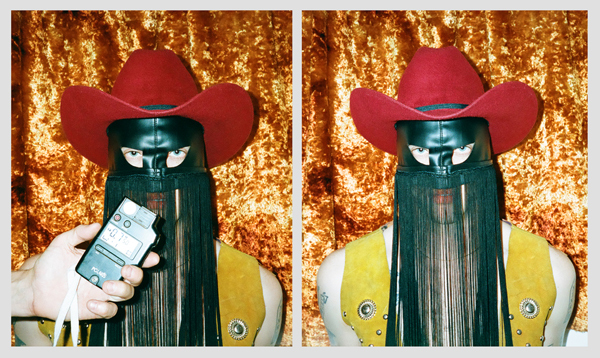 Combining the lulling ambiance of shoegaze with the iconic melodies and vocal prowess of classic American country music, outlaw cowboy, Orville Peck croons about love and loss from the badlands of North America. The resulting sound is one entirely his own - taking the listener down dusty rose-colored desert highways; through a world where worn out gamblers, road-dogs, and lovesick hustlers drift in and out of his masked gaze. Orville’s music will be available worldwide from Sub Pop, except for Canada through Royal Mountain Records. “Big Sky,” his first single, is a campfire lullaby of Orville’s past lovers. He sings about his relationships - with an aloof biker, an abusive boxer and an overly protective jailor in the Florida Keys - and the inevitable demise of each one, as Orville leaves them for the wide open big sky. Watch his official video for the song, directed by Deni Cheng, which follows our anti-hero as he travels through his America, waiting for time to pass.